A versatile fruit that’s packed with nutrients and flavour, Australians are now eating more avocados than they ever have before. 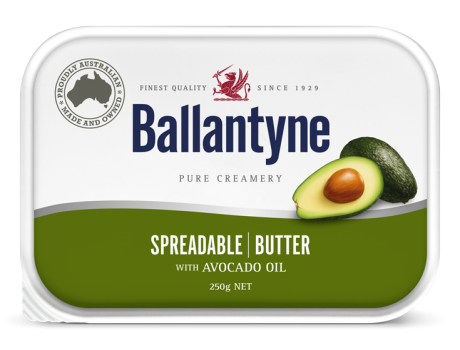 Ballantyne Spreadable with avocado oil blends the nutty taste of avocado oil with Ballantyne’s Traditional creamy butter. 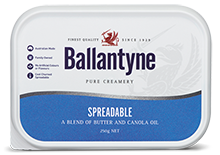 For lovers of all things creamy. 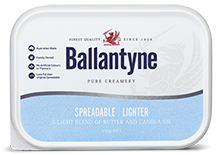 Butter (min. 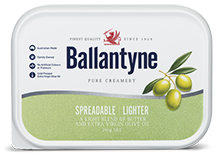 40%), water, avocado oil (min.13%),Canola Oil, Salt, Preservatives (202).